The year 2011 marks the 400th anniversary of the publication of the Authorized Version in 1611, now commonly known as the King James Bible. No other Bible translation has had such an impact; no other continues to be the translation to which all new ones are compared. Crowned With Glory: The Bible from Ancient Text to Authorized Version is a detailed look at the history of text of Holy Scripture, from original autograph to English translation. Approaching the issue of Bible text and translation from a scriptural and scholarly perspective, Dr. Thomas Holland explores the science of textual criticism in light of biblical preservation. From the rich history of the early English versions to the modern discovery of the Dead Sea Scrolls, this book takes the reader on a captivating journey through the transmission and translation of Scripture. Differences between the Traditional and Critical Texts are examined, "mistranslations" and debated passages are explained, corrupting forces in the transmission of Scripture are exposed, and the testimonies and sacrifices that paved the way for the Authorized King James Version are exalted. Regardless of one's view on the the controversial issues of Bible text and translation, Crowned With Glory is a must-read for anyone who seeks a greater understanding of the debate, and knowledge of the history of the Bible. 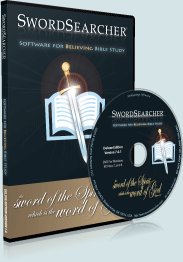 As a SwordSearcher book module, the contents of this book can be instantly searched for word or verse reference. Links in the Bible margin appear next to each verse discussed in Crowned With Glory to make accessing the information in this great resource quick and easy. The verse guide can also be used to locate relevant details about verses in the book. 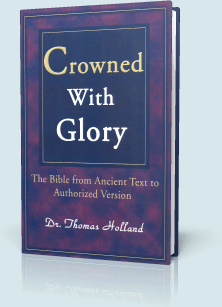 The author of Crowned With Glory (Dr. Thomas Holland) has been a pastor and scholar, teaching courses on Bible manuscript evidence and textual criticism, theology, and Christian apologetics at various Bible Institutes. Crowned With Glory: ISBN 0595146171, Copyright 2000 Dr. Thomas Holland. Used with permission.